This article is about Chicago's central section of elevated rail. For the central Chicago community area, see Chicago Loop. 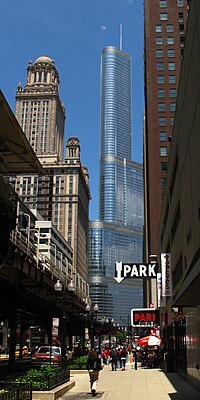 The Loop (historically Union Loop, or commonly Loop) is the 1.79-mile (2.88 km) long circuit of elevated rail that forms the hub of the Chicago "L" system in Chicago, Illinois. As of 2012, the branch has served 74,651 passengers every weekday. 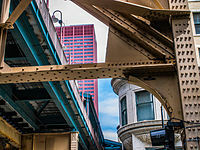 The Loop is so named because the elevated tracks loop around a rectangle formed by Lake Street (north side), Wabash Avenue (east), Van Buren Street (south), and Wells Street (west). The railway loop has given its name to Chicago's downtown, which is known as the Loop. Numerous accounts assert that the use of this term predates the elevated rail, deriving from the multiple cable car turntables, or loops, that terminated in the district, and especially those of two lines that shared a loop, constructed in 1882, bounded by Madison, Wabash, State, and Lake. However, transportation historian Bruce Moffat has concluded that "The Loop" was not used as a proper noun until after Charles Yerkes' 1895–97 construction of the elevated structure. Chicago Transit Authority control tower 18 guides Chicago 'L' trains north and southbound Purple and Brown lines intersecting with east and westbound Pink and Green lines and the Orange line above the Wells and Lake street intersection in the loop. 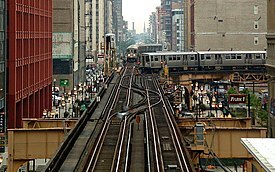 An Orange Line train approaches Quincy on the Wells Street portion of the Loop in 2008. The Loop includes eight stations: Clark/Lake and State/Lake are on the northern leg; Washington/Wabash and Adams/Wabash are on the eastern side; Harold Washington Library – State/Van Buren and LaSalle/Van Buren are on the southern leg; and Quincy and Washington/Wells are on the western side. In 2011 20,896,612 passengers entered the 'L' via these stations. The Purple Line Express (weekday rush hours only) and the Brown Line enter from the north at the northwestern corner. The Purple Line Express makes a full circuit in the clockwise direction while the Brown Line makes a full circuit traveling counterclockwise. The Orange Line enters from the south at the southeastern corner and the Pink Line enters from the west at the northwestern corner; both making a full clockwise circuit. Following the completion of a full circuit in their directions, trains of these four lines return to their terminals making stops in the reverse order they made when heading to the Loop. The Green Line runs in both directions but does not make a full circuit, using only the north and eastern sides of the Loop to move between the Lake Street branch and the South Side Elevated. Two of the remaining three lines, the Blue Line and the Red Line, run underground through the center of the Loop, connecting to Loop stations. The Yellow Line is the only CTA line that does not run on or connect to the loop. Two towers control entry to and exit from the Loop. Tower 12 stands at the southeastern corner. Tower 18 stands watch over the three-quarter union located at the northwestern corner, which at one time was billed as the busiest railroad interlocking in the world. The current Tower 18 was placed into service on May 19, 2010, replacing the former modern tower on that site that was built in 1969. Prior to construction of the Union Loop, Chicago's three elevated railway lines—the South Side Elevated Railroad, the Lake Street Elevated Railroad, and the Metropolitan West Side Elevated Railroad—each had their own terminal on the edges of downtown Chicago. Charles Tyson Yerkes masterminded the linking of these railroads. The Union Loop was constructed in separate sections: the Lake Street 'L' was extended along the north side in 1895; the Union Elevated Railroad opened the east side along Wabash Avenue in 1896 and the west side along Wells Street in 1897; and the Union Consolidated Elevated Railroad opened the south side along Van Buren Street in 1897. Originally there were 12 stations, with three stations on each side. The construction of the west-leg of the Union Loop over Wells Street required the removal of the southern platform of the Fifth/Lake station. The addition of the Northwestern Elevated Railroad caused the removal of the rest of the station as the remaining platform sat across the new road's entry point. This left 11 stations, two on the north leg of the loop and three on each other leg. The Loop was born in political scandal: upon completion, all the rail lines running downtown had to pay Yerkes's operation a fee, which raised fares for commuters; when Yerkes, after bribery of the state legislature, secured legislation by which he claimed a fifty-year franchise, the resulting furor drove him out of town and ushered in a short-lived era of "Progressive Reform" in Chicago. This lists each station beginning at the northwest corner and moving counterclockwise around the loop: south along Wells Street, east along Van Buren Street, north along Wabash Avenue, and west along Lake Street. Dearborn/Van Buren Dearborn Street and Van Buren Street Closed 1949, replaced by Library-State/Van Buren on June 22, 1997. Transfer station for Blue and Red Lines. State/Van Buren 400 S. State St. Closed September 2, 1973, Replaced by Library – State/Van Buren on June 22, 1997. Madison/Wabash 2 N. Wabash Avenue Closed March 16, 2015, demolished and replaced by Washington/Wabash. Washington/Wabash 29 N. Wabash Avenue Consolidation of Madison/Wabash and Randolph/Wabash, opened August 31, 2017. Randolph/Wabash 151 N. Wabash Avenue Closed September 3, 2017; demolished and replaced by Washington/Wabash. ^ "Annual Ridership Report" (PDF). Chicago Transit Authority. Retrieved 22 May 2017. ^ "2012 Annual Ridership Report" (PDF). Chicago Transit Authority. transitchicago.com. Archived from the original (PDF) on December 6, 2013. Retrieved January 2, 2014. ^ Patrick T. Reardon. "It All Starts Downtown". Hartford Courant, July 26, 2004 (from the Chicago Tribune). Accessed 19 March 2009. ^ a b Garfield, Graham. "Tower 18". Chicago-L.org. Retrieved 2010-06-12. 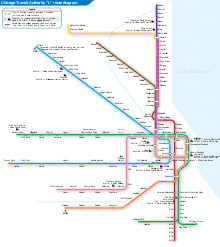 ^ "Chicago L.org - The Chicago rapid transit internet resource". www.chicago-l.org. ^ "Chicago L.org: Stations - Fifth & Lake". www.chicago-l.org. ^ Paul Barrett. "Chicago's Public Transportation Policy, 1900–1940s", 8 Ill. Hist. Teacher 25 (Illinois Historical preservation Agency, 2001). Historic American Engineering Record (HAER) No. IL-1, "Union Elevated Railroad, Union Loop"
This page was last edited on 23 March 2019, at 20:14 (UTC).